It's important to know what version of the start template you have installed. 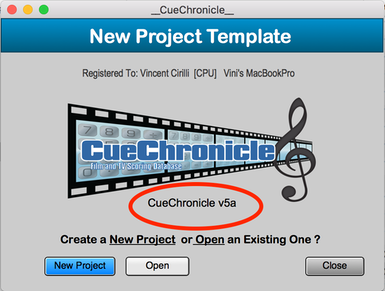 Open the file in your Applications>CueChronicle Folder. The New Project Template window opens. Note the version below the CC logo. This will be the version of any new projects you create from the template. Updating your start template to a newer version will not change the versions of the CC projects you have already created, or that have been passed to you from other users. Open the project file who's version you want to check. At top left above the layout name you will see the fileâ€™s version. To update an existing project to a newer version of CC see the links below.